Strymon volante pedal brings tape echo a bit further. 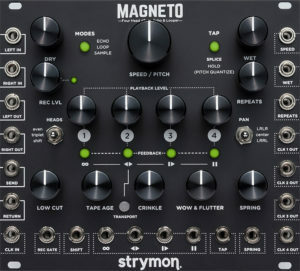 As implied by the Magnetic Echo Machine legend boldly blazoned across an attractive, rugged, road-ready, yet functional front facia that should feel familiar to owners of Strymon’s similar-sized effect pedals such as the award-winningBigSky (multidimensional reverb) or TimeLine (multidimensional delay) — or, for that matter, its inspirational Magneto Four Head dTape Echo & Loopermodule with which it shares some controls and design DNA, Volante features magnetic drum, tape, and (reel-to-reel) studio echo as a stereo multi-head delay that also offers a looper and vintage reverb. Reality dictated that Strymonrelentlessly studied and faithfully recreated every last magnetic delay system attribute to capture the nuance and complexity of classic tape and drum echo machines — from sought-after natural saturation and soft clipping of magnetic media when driven hard to hands-on, real-time controls for MECHANICS,WEAR, SPACING, and LOW CUT, Volante instantly adds tons of vibe to any user’s sound. Some classic tape echo machines included small integrated spring reverb tanks tuned to limited bandwidth. Strymon skilfully captured this vintage vibe forVolante by creating a spring reverb with a gorgeous, gentle character that stands up to scrutiny on its own while also enhancing delayed signals. By being designed from the ground up to radically enhance the sonic expressiveness of pedalboards, performance is clearly central to Volante’s raison d’être. Delayed psychedelic feedback sounds can be unleashed on command when working in Echo mode by pressing and holding the ONfootswitch to activate Infinite Repeats; regardless of the current REPEATSsetting, Volante will crank up echo regenerations for quick-building delay feedback — foot off of the switch results in Volante returning to the previous setting. Armed with full MIDI control of every parameter, plus 300 preset locations,Volante is designed to be the center of sonic expressiveness for MIDI pedalboards. Put it this way: Volante transmits and receives MIDI over 5-pin DIN, USB, and even its EXP (expression) jack. Connecting an expression pedal opens up a whole new level of instantaneous, constant control; set as many knobs as desired for the heel and toe positions of the connected expression pedal and all settings simultaneously morph through the expression pedal’s full range. Remaining, briefly, outside of Volante itself, connecting Strymon’s simultaneously-announced MultiSwitch Plus accessory to Volante’s EXP jack adds additional footswitchable control; select between three presets, remote control of the SPEED switch, remote transport control, or further foot control while in Sound On Sound mode. Continuing connectivity advancement, a dedicated INST (instrument)/LINEinput level switch ensures that Volante can comfortably work with a variety of input sources — switch to INS when using a guitar level input, LINE when usingVolante in the effects loop of a guitar amp or driving it with a hot output from a synth or mixer insert. Indeed, the LINE input is also perfect for using Volante as a send effect or insert effect in the studio. Seriously flexible, then, the pedalboard sonic expressiveness-enhancing Volantereally rewards experimentation, yielding rich, hypnotic, and often unpredictable results — albeit always highly musical. Making room for one (or more) in a pedalboard or studio setup surely sounds like a perfect plan! Strymon is already accepting pre-orders for Volante via the Strymon Store (https://store.strymon.net/volante/)to American Samoa, Canada, Puerto Rico, United States, and United States Minor Outlying Islands for $399.00 USD (plus tax and shipping) or through its growing global network of authorized dealers (https://www.strymon.net/dealers/).